Despite achieving strong growth, lack of local production and low consumer interest in organic packaged food in Saudi Arabia means the category remained niche in 2018, mainly comprised of baby food and cereal bars with most consumers preferring FF or NH products. At the same time, local companies remained cautious in entering the category due to high production prices and lack of consumer awareness concerning the health benefits of organic packaged food. Product coverage: Organic Baby Food, Organic Bread, Organic Breakfast Cereals, Organic Chilled Processed Meat and Seafood, Organic Confectionery, Organic Dairy, Organic Edible Oil, Organic Frozen Meat, Seafood, Fruit and Vegetables, Organic Ice Cream, Organic Ready Meals, Organic Rice, Pasta and Noodles, Organic Sauces, Dressings and Condiments, Organic Savoury Snacks, Organic Shelf Stable Meat, Seafood, Fruit and Vegetables, Organic Soup, Organic Spreads, Organic Sweet Biscuits, Snack Bars and Fruit Snacks. Data coverage: market sizes (historic and forecasts), company shares, brand shares and distribution data. Why buy this report? * Get a detailed picture of the Organic Packaged Food market; * Pinpoint growth sectors and identify factors driving change; * Understand the competitive environment, the marketâ&#x20AC;&#x2122;s major players and leading brands; * Use five-year forecasts to assess how the market is predicted to develop. 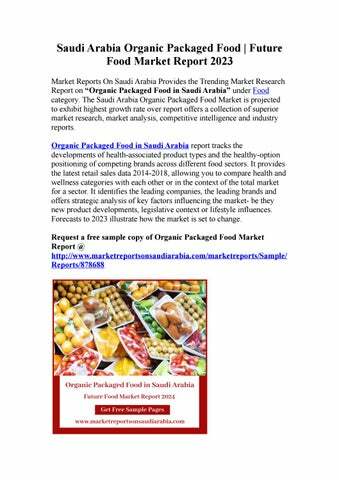 Browse our full report with Table of Contents : http://www.marketreportsonsaudiarabia.com/marketreports/organic -packaged-food-in-saudi-arabia/878688 About Us Market Reports on Saudi Arabia provide you with an in-depth industry reports focusing on various economic, political and operational risk environment, complemented by detailed sector analysis. We have an exhaustive coverage on variety of industries â&#x20AC;&#x201C; ranging from energy and chemicals to transportation, communications, constructions and mining to Food and education. Our collection includes over 2000 up-to-date reports all researched, analyzed and published by top-notch international research firms.